Top 10 Basic Tips That Are Easy To Follow! 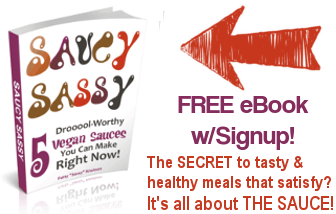 With a never-ending thirst for knowledge about not only the proper nutrition for a vegan, but how to make cooking deliciously simple, I've taken some time to gather my over-two-decades of experience and knowledge of vegan nutrition into one tidy place. But if you're in a bit of a rush and just want the basics laid out for you, then you'll find my Top 10 Basics of Nutrition for a Vegan below. Sort of a "Quick Guide" for your convenience. Be sure to follow the links to learn more about the importance of water, vegetables, greens, whole grains, beans, fruit, raw foods, nuts and seeds, how to choose oils, and the importance of whole foods. Just a little boost to get you started on your way. Thanks for the list of BASICS. It's Sass-tastic! Topping the list is water and water-rich foods. Water helps your body to stay hydrated so it can perform at its optimum. Feeling tired? Drink some water -- you just might be dehydrated (most people are!). Water helps to lubricate the pipes, so to speak. How much water do you need? 6-12 (8 oz.) glasses a day. Why the huge range in number of glasses/day? If you're eating lots of water-rich fruit, then you can drink less water. If you're fruit deficient, drink more water. Most important, be sure your water is clean and filtered. Avoid tap water whenever possible. Purchase one of those water filtration systems that sit right on the corner of your sink or counter top. It allows you to filter your water -- great for drinking, washing produce, boiling pasta or beans, making soups, etc. We use a Berkey Water Purification System in our home. Have you heard of Berkey? OMG! Amazing (that's it on the right). Uses no electricity, you RARELY have to replace the filter "candles", completely portable which makes it perfect for an emergency, and best of all the water tastes perfectly clean and delicious. I didn't know water could taste this pure. Highly recommended. Most people love veggies -- there's so many to choose from you're bound to find some favorites. But if you're one of those people who just despise vegetables, might I recommend you give it another go -- try different cooking techniques, find a new veggie you've never tried before, use different flavorings. I can't stress enough how important it is to make veggies your number one priority as they're filled with so many nutrients we need, including protein, carbs, minerals and vitamins. 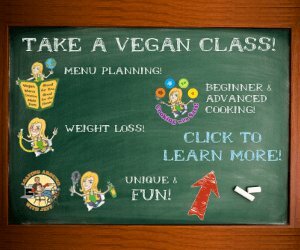 For helpful information about veggies, including selection tips, cleaning advice, cooking techniques and flavoring ideas visit the Vegan Coach Vegetable Cooking Guide. "Ummmm, Sassy? You already mentioned veggies!" Well, my darling, there's a very good reason for this: Because it's so vital that you add dark green leafies in that they get their very own place in my Top 10. I'm talking about kale, Swiss chard, greens such as beet greens, collards, and mustard and turnip greens, and spinach, just to name a few. When many people think of grains, the first thing that comes to mind is usually rice. I adore brown rice and eat it often. But it's important to mix it up a little for some variety. If you're stuck in a rice rut, investigate the different grains available, like quinoa, millet, barley, or buckwheat. There are many types of grains out there to search out and prepare making cooking quite the adventure. For helpful information about whole grains, including selection tips, cleaning advice, cooking techniques and flavoring ideas visit the Vegan Coach Whole Grains Cooking Guide. Beans are a tremendous source of the whole-food protein we need. It took me many years of purchasing canned beans (very occasionally, by the way) before I discovered how easy and cheap it is to just make your own beans from scratch. Now, beans are a part of my weekly vegan menu planning. Why make your own instead of buying canned? You can make your beans in quantity to get you through the week -- and even freeze some for future use. Plus, there just something special about sitting down to dine on beans that YOU helped to create. 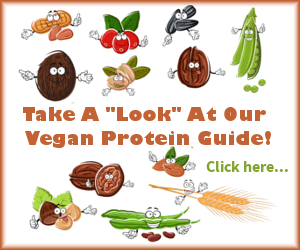 For helpful information about the protein found in beans and other food sources visit the Vegan Coach Protein Guide. For lots of good info about how to prepare beans, visit our Bean Cooking Guide. Crunchy apples, cold grapes, juicy peaches, melt-in-your-mouth strawberries -- who doesn't love FRUIT? 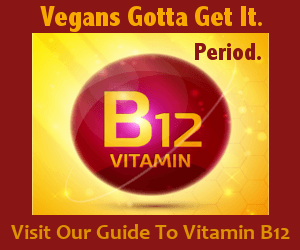 Packed with water and fresh raw nutrients, they're a vital part of the vegan diet. Eat them on their own, or mix into a delicious and refreshing smoothie. One basic rule of fruit: Try not to mix fruit with other foods, to derive the most benefit. But never mix melon with any other foods (not even other fruits). Why? Due to the quick digestion of melon, it could break down in your system before other foods, causing heartburn, gas and other unmentionables. Not to mention creating unnecessary toxicity, since all foods release post-digestion toxins into your system if not allowed to evacuate as quickly and easily as possible. For more on this, study the topic of Food Combining. Visit our helpful Vegan Coach Fruit Guide. Raw foods provide some powerful nutrients and enzymes that your body craves. You don't have to become a raw foodist to enjoy raw foods. 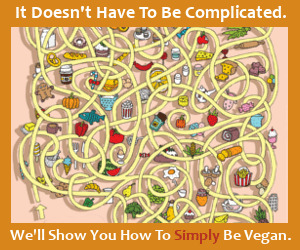 But it's extremely important to include some raw vegan foods when planning your vegan meals. Try your hand at creating at least one completely raw vegan meal per week in the warmer months. Your body needs healthy fats to function properly. And some of the best sources for healthy fats come from nuts and seeds, which you should try to have every day. Not only is it important to actually eat them, but it's important to eat those that will provide you the most well-rounded healthy fats. So mix up some seeds (such as pumpkin, sunflower, and sesame) and keep in your fridge, then remove a couple Tablespoons of it, grind, and sprinkle on salads and veggies. Very delectable! Do you have a recipe that calls for toasted seeds? Heat a large pan over medium-high heat, add seeds to the dry pan, and stir (or shake the pan) often until seeds are toasted and fragrant. It takes a little time for the toasting to begin, but once a few start the rest will quickly follow. Remove from pan and spread onto a plate to cool completely. Need to toast some nuts? Heat oven to 350 degrees F. Place nuts on a cookie sheet, place dry nuts in heated oven until desired toasting has been reached (5-15 minutes), stirring occasionally. Watch carefully -- it takes just one minute for them to all burn! Remove from pan and spread onto a plate to cool completely. If you're like some people out there who have trouble digesting nuts, this discussion about nut digestion will interest you. There are some people who shun oils. If that is you, then you can ignore the rest of this tip. If you DO use oils in your cooking, it's important to avoid those that can tilt the nutritional balance out of your favor. There's a bit of an epidemic these days -- people tend to eat far too much of the oils that can cause damage inside their body; namely, refined oils. And while, for example, extra-virgin olive oil might not necessarily be considered a benefit to a healthy diet, it is actually more neutral than some might have you believe and not nearly as damaging as animal-based fats. Is it best to avoid all oil in your diet? Studies seem to say it's a good idea to eliminate oils because they are basically empty calories. But it's not always easy to switch from using lots of oil to using no oil whatsoever. So the following advice is to help you make it through until you can say goodbye to oils for good. 1. Veggie broth usually does the trick when sautéing many foods. But if you feel you must use oil (such as to fry a veggie burger), then add a little oil to a napkin and "swipe" into the bottom of the pan. There is rarely a need to "pour" oil into a pan. But if you must, then be sure to add a little water or broth to the pan BEFORE HEATING to ensure the oil never gets too hot. 2. Avoid refined oils. When an oil is refined it means that it's been mechanically pressed and then treated with hexane (a dangerous chemical), which exposes it to high temperatures, deodorizing and bleaching. Its health-giving qualities are processed away, and its omega-3s are converted into trans fats. Even "lightly refined" and "expeller pressed" oils can be exposed to deodorizing, and when most oils are subjected to extremely high heat, they're forever changed and no longer offer the nutritional support you desire. When you see oils on your grocery shelf that are packaged in see-through containers, those oils have been refined to make sure they're stable at high temperatures, and so they can sit on the shelves for long periods of time. 3. Choose unrefined oils since they have NOT been subject to these potentially dangerous methods. Cold-pressed is always the optimum oil due to the fact that high heat is not used, therefore the nutritional qualities stay intact. You'll usually find cold-pressed, unrefined oils packaged in dark containers, many times (but not always) refrigerated. 4. Some oils can be expeller pressed and NOT treated with the dangerous hexane, thus not subjected to high heat. Be sure to check your source to be sure your expeller-pressed oil is also cold-pressed. 5. Occasional use of coconut oil (such as when frying up some pancakes or French toast) is okay when veggie broth or the strong flavor of olive oil won't do -- and as you make the transition away from refined oils such as sunflower, safflower, and canola. Again, I repeat the word "occasional." If so, be sure your coconut oil is purchased cold-pressed and unrefined whenever possible; it's a very stable oil and can actually withstand higher cooking temperatures. 6. Margarine and shortening go through a process called hydrogenation which makes them very toxic. Intake of these oils promote cancer. Hydrogenation also turns the polyunsaturated oils into an extremely harmful substance known as a trans-fat. Trans-fatty acids are very dangerous. And in addition, they have been found to actually elevate blood cholesterol. A better option would be non-hydrogenated, made without the process of hydrogenation. One which is readily available in most health food stores (and even some mainstream grocery stores) is called Earth Balance. I love the taste of Earth Balance and it's an excellent replacement for butter or margarine. I buy and recommend the organic variety. Cooking with and eating whole foods really helps to just completely take the guesswork out of proper vegan nutrition. Every time you choose whole foods over anything that's pre-packaged you're ahead of the game. Most of your time in the grocery store should be spent in the produce section and the bulk section. If you find yourself purchasing most of your food from the center aisles, lined with canned goods, boxed foods, or frozen foods, then head for the edges of the store, pronto! By the way, organics are best, whenever possible. Why? Because they provide the organic nutrition you need, meaning grown without pesticides, herbicides, fungicides, or other poisons you don't want in your body. Click to learn about how to cook with whole foods. 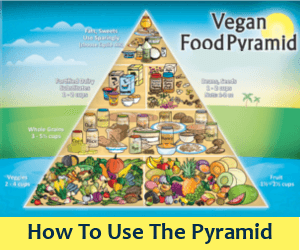 Sassy's Top 10 Vegan Nutrition Tips. 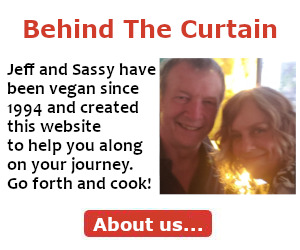 "I ADORE your website and have already passed it on to all my loved ones and close friends, plus two with cancer, hoping people like us can be a good and healthy influence on them. (Not to mention how you make everything SO easy to understand and learn on your site. It is already changing my life!)"